A lot of technology and considerations hides behind this easy way of shopping. The experience for AH to go customers is now more fun and flexible than ever because of the clearly considered choices in mobile technologies. No more being late for your train departure or lecture because of the queue at the cash desk. "The less time you need to spend in a shop, the better. That really is a no-brainer," says Jan-Willem Dockheer, general manager of AH to go. Albert Heijn and CM.com joined forces to make it all happen. The concept was first tested at the AH to go store at the headquarter of Albert Heijn Delhaize in Zaandam. The employees at the headquarter were informed about the new Tap to go service, via an SMS campaign with a mobile landing page. 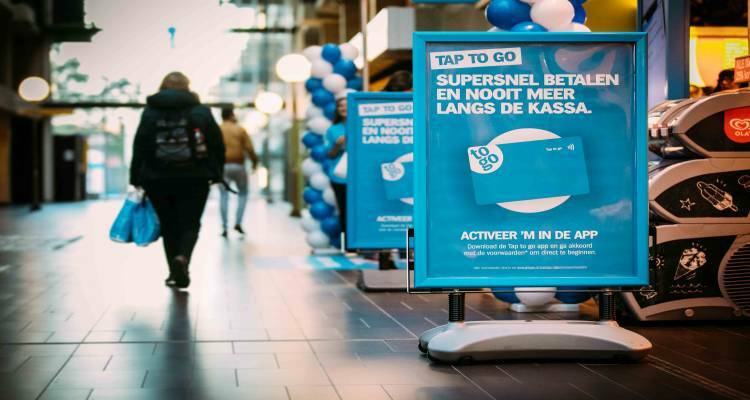 After a successful pilot, Tap to go was launched to the public on the 24th of September at the AH to go store at the Academic Medical Centre in Amsterdam. Tapping is possible via card and mobile phone. The Tap to go app can easily be downloaded. Tap cards will be distributed throughout the pilot stores. Registration must be done via the AH to go app. Upon every registration, the customers’ mobile phone number will be verified via a One Time Password from the CM.com platform. Furthermore, to make payments possible, the customers’ bank account number must be verified, which is done with IBAN-verification on the CM.com platform. The customer will pay an initial transaction fee of € 0.01 in order to verify the bank account. After the account is verified successfully, Tap to go is ready for use. Simply tap, grab, go! The technology, both in the card and in the phone, uses active NFC, or Near Field Communication. NFC is a wireless way to exchange small amounts of information within a radius of 10 centimeters. This standard chip is used in most bank cards, loyalty cards, and telephones and allows communication with other devices, such as PIN terminals. The specially developed digital shelf tags can be scanned accurately, after which the input is processed directly to the digital shopping cart. According to Bas Peters, one of the developers behind the new payment concept of CM.com, NFC offers an unprecedented low-threshold way to put products in your shopping basket. "The self-scanner that became popular in recent years has become redundant. Your mobile phone or Tap to go card is all you need." After 10 minutes of inactivity of the tap card or mobile phone, the customer receives a Push message with the amount debited from his or her bank account. The direct debit also runs via the CM.com platform. Should the collection fail, because the balance is too low for example, the collection will automatically be repeated by the AutoCollect system of CM.com. If the collection fails twice, CM.com will send the customer an iDeal payment link via SMS and e-mail on behalf of AH in order to complete the payment easily and safely. In the meantime, Albert Heijn has insight into visitors and purchases at all times. CM.com provides Analytics with all relevant data from CM Data in a clear dashboard. In this Tap to go dashboard, Albert Heijn can monitor exactly how many shoppers there are and what is being spent. 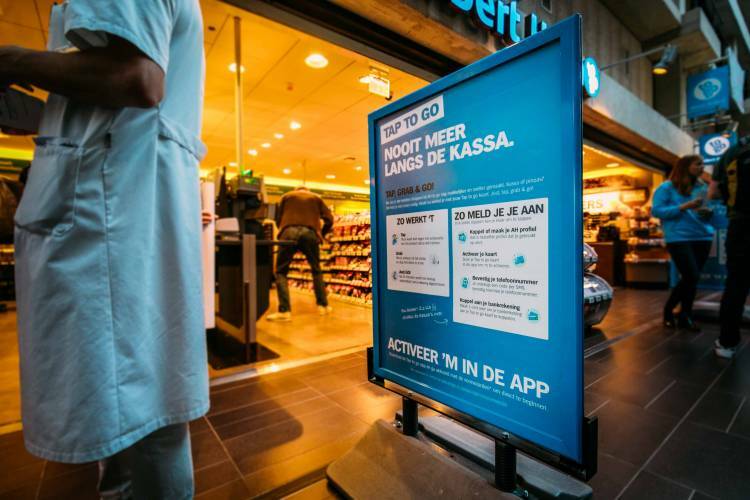 This is not the first time Albert Heijn has used the CM.com platform to improve the customer experience. CM.com has been sending SMS notifications for AH’s online shipments. Every customer receives an SMS with the exact time frame until groceries are delivered.